We know they aren’t mad keen on fireworks, but there are other dangers for our furry – and spiky – friends. We’ve got some simple tips to keep them safe. Maybe they’re not the first animals we consider on bonfire nights but spare a thought for these little bundles. Horsham-based international wildlife charity Born Free is reminding people to look out for hedgehogs who might be in trouble at this time of year. At the end of October hedgehogs start looking for a place to hibernate, and with Guy Fawkes’ Night just around the corner, a pile of dry leaves in the garden or an unlit bonfire are attractive places for a sleepy hedgehog looking for somewhere to build its nest. So give that pile of leaves a good poke before setting it on fire, and build the pile on the day you’re going to burn it. If you find a hog, pop it in a box in a quiet dark place, with some meaty dog or cat food and some water til the celebrations are over. Autumn is often a tough time for hedgehogs, especially underweight ones who aren’t fattened up properly for hibernation, so keep an eye out. If you see a hedgehog in the daytime, that’s a warning sign as they’re nocturnal, so it’ll need your help. There are very few dogs who breeze through the seasons of bangs and fizzes without concern, so the Dogs Trust in Shoreham have come up with some tips to help your furry friend make it through with as little stress as possible. 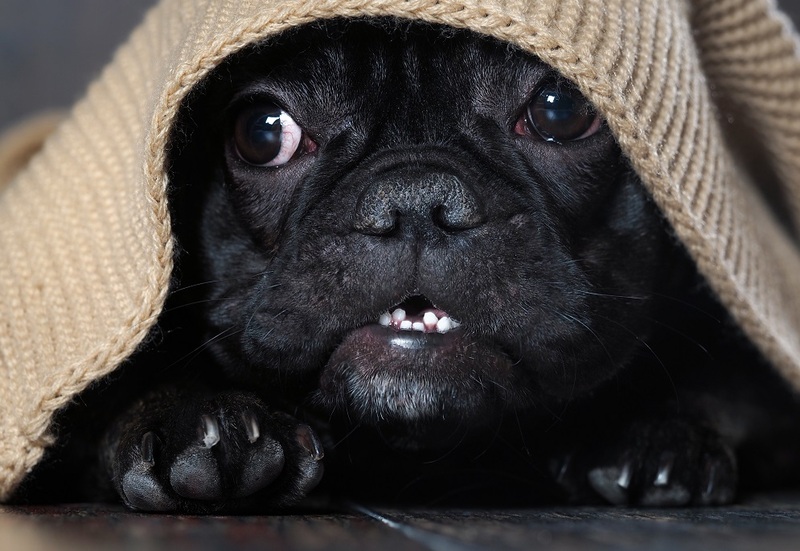 Building a ‘doggy den’ can really help your dog feel safe and secure during the noises. Dogs Trust Director of Canine Behaviour and Research, Dr Rachel Casey, explains how creating a safe environment can help. “Many of us enjoy the experience of fireworks but for our dogs it’s often a terrifying experience. Dogs have approximately four times more sensitive hearing than us, and also have a more extensive range of hearing – they can hear much higher frequency sounds than we can – so just imagine how loud a firework bang is for a dog. “The smells and flashing light of fireworks are also unusual for dogs. Fireworks tend to be sudden, unpredictable and bright, and this cocktail of effects can often have a profoundly negative impact on dogs. “One tip we have for concerned dog owners is to create a doggy den, a haven where dogs can feel safe and secure. The doggy den should be built away from hubbub of the family home, somewhere quiet where the dog can rest peacefully. This will very much be a safe space for the dog, but they should be able to move in and out of the den freely; making it as cosy and snug as possible is a must, but your doggy should be able to see out of the den should she want to. 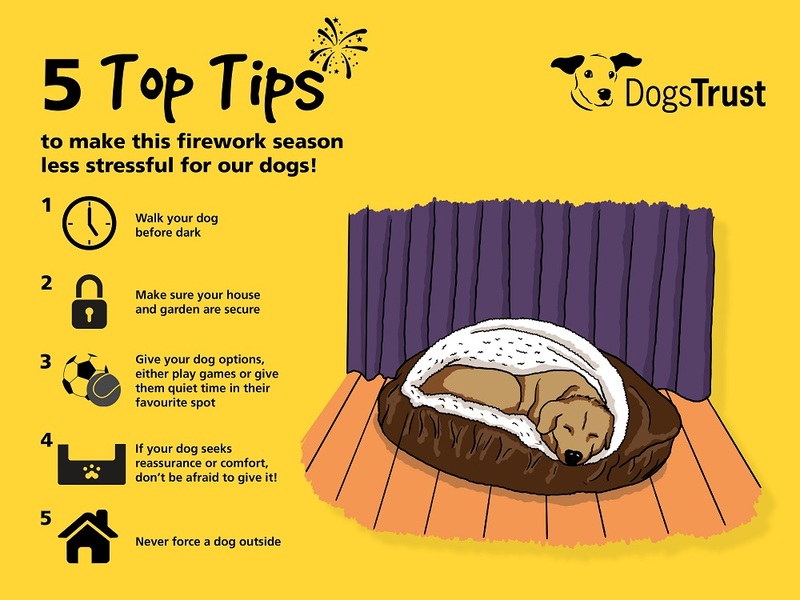 Dogs Trust has created a video demonstrating the best way to build a doggy den, you can view it here and also read more about fireworks advice on their dedicated webpage.